The January 2018 monthly Greater Atlanta Coin Show was cold outside, but the bourse inside was filled with people viewing the many coins and collectibles. The first monthly Greater Atlanta Coin Show of the new year had cold temperatures but didn't have the frozen white stuff of the last show. Though, we saw what oldtimers called spittin' snow on the Saturday night before the show. Spittin' snow is when Mother Nature is just playing, not really wanting to generate a real snowstorm. She still made it cold with Sunday morning's temperatures in the teens with the midday thermometer rising into the low 30s. Thank you to all of the people who attended, from the visitors to the dealers, to our security and to the hotel's staff. We appreciate all of your participation each month in making the coin show a popular place to see, buy, sell and trade numismatics and collectibles. In early January, several of our dealers always travel to Florida for the F.U.N. show. This year, dealers attended the show in Tampa and returned to set up at the monthly show a week later. Of course, dealers attend shows not only to display and sell their coins and collectibles but also to buy. They trade among other dealers and also with the public. That allows them to offer new and different items at each show. As for the January hotel, there were not many people staying at the facility unlike the holiday months of November and December. Also this month, just two churches used the hotel's space in addition to the show. But, that is similar to previous years - not much hotel traffic in January. Now, let's take a look at some of the items on the bourse, highlighting first a few national bank notes then a couple of interesting collectibles. "For the most part the rarity of a national bank note is based on the number of such banks recorded for a particular state. However, there are other criteria that will affect the availability of particular notes, i.e., the size of the community or city where the bank was located, denominations issues, the length of time the bank operated and the desirability created by odd or interesting names." All of the following notes are small-size, brown seal, series 1929 specimens, and of particular interest, they are all from Georgia banks. Let's take a look at each note and identify some of its characteristics. In spite of the cold weather, the show enjoyed lots of visitors on the bourse. The Bank of Atlanta, charter number 1559, organized on September 2, 1865 as Atlanta National Bank. On February 6, 1924, it became Atlanta and Lowry National Bank. 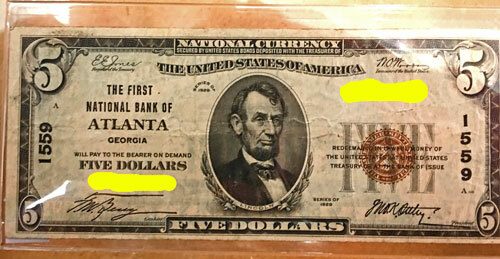 On November 23, 1929, their title changed to First National Bank of Atlanta, as seen on this note. Under the bank's third title, they distributed the $5 notes from 122,852 six-note sheets of the Type I version. In total, under all three titles and all denominations, the bank issued $30,939,380 national bank notes. In 1933, $4,848,930 of this currency was still outstanding. 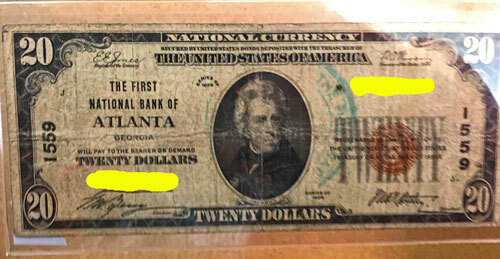 The First National Bank of Atlanta also issued this next $20 currency with its portrait of Andrew Jackson by Alfred Sealey. This note, like the $5 above, is a Type I. Type I notes have the charter number printed in black on the left and right of the note's obverse. For the $20 note, the bank distributed the currency from 22,914 six-note sheets or $2,749.630. The outstanding notes for the charter 1559 also included the notes from charter 5045, which was the Fourth National Bank of Atlanta. Charter 5045 closed on November 23, 1929, the same day the third title for charter 1559 began. Charter 1559, First National Bank of Atlanta, assumed circulation of the charter 5045 currency. The charter bank numbered 1639 corresponds to the National Bank of Athens. Their charter began in 1866 and issued $3,712,320 across all denominations and years. The Type I national bank note $10 included the G. F. C. Smilie portrait of Alexander Hamilton. The Athens bank distributed the notes from 7442 sheets of $446,520 value. The small size notes were printed in a single column of six notes per sheet. The next example is another version of the $20 national bank note, again from the National Bank of Athens. All of the small-size notes from the brown-seal 1929 series show the signatures at the top of Edward E. Jones on the upper left as the Register of the Treasury and Walter O. Woods on the upper right as the Treasurer. Officials from the bank signed at the bottom with the cashier's signature on the left with the president's signature on the lower right. The president's signature is the same on the $10 and $20 notes, however different cashiers signed these two notes on the lower left. The bank distributed $257,040 from 2142 sheets of the Type I $20 notes. The bank charter numbered 7300 began in June of 1904 for the First National Bank of Madison. Throughout the national bank note years, the Madison bank issued $2,287,120 in denominations of $10 and $20. In 1935, $100,000 notes remained outstanding. For the 1929 small-size $10 currency, the bank issued $173,160 from 2886 Type I sheets of six notes each. For this note, cashier L. D. Wallace signed on the left and bank president H. H. Fitzpatrick signed on the right. Though they began in 1927, the bank still managed to issue $6,159,440 in 1929 series small-size $5s, $10s and $20s. For the $10 Type I national bank notes, the bank distributed $2,093,160 from 34886 six-note sheets. In 1935, the small-size national bank notes still outstanding from this Savannah bank totaled $500,000. The next chartered bank, number 13068, began on May 2, 1927 as the Citizens and Southern National Bank of Savannah. The Albany bank may have been late to the charter list, however it still issued $596,520 in $5s, $10s and $20s. For the Type II $20 notes, they distributed $26,640 from 1332 notes on 222 six-note sheets. In 1935, $100,000 remained outstanding of their specifically identified currency. This note from Albany is the only example of a Type II note in this set of images. The City National Bank of Albany chartered as number 13223 in July 1928. As a Type II, the note has the charter number beside each serial number in the same color and print type as the serial number. It also has the black charter numbers in the same positions as the Type I notes on the right and left. 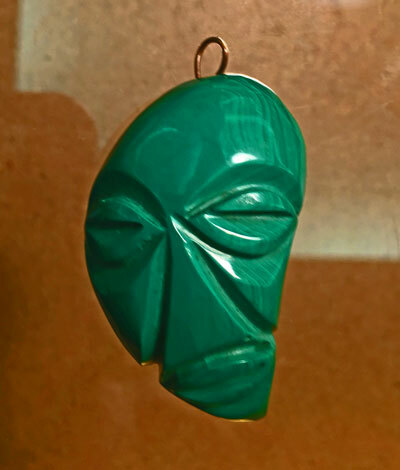 Next on our list is an interesting and odd-looking pendant made of malachite. This green mineral is a basic copper carbonate and can be found in colors from light to dark green, sometimes with shaded bands of green, and sometimes sparkling. Fine malachite comes from many places around the globe such as the Ural Mountains of Russia, Kolwezi in Zaire, Tsumeb in Namibia, Touissit and Kerrochene in Morocco, Burra Burra in South Australia, Chessy in France, and a variety of locations in Brazil. In the United States, Arizona and Colorado have the best deposits of the green mineral. Oddly, the polished stone is safe to handle and to wear, however working with raw malachite can be dangerous. People work with the stone underwater to minimize any airborne poisonous dust. "It reminds us that we have a dual nature and it is up to each person to know and rule his own person. "To help get rid of nightmares, keep a piece of Malachite in your bedroom." This little malachite face would be a good one to help ward off the evil eye or to get rid of nightmares. "It is said to protect the wearer from accidents and protects travelers. Malachite has been used to aid success in business and protect against undesirable business associations. It is a stone of balance in relationships. "Ancient Egyptians, Greeks and Romans used malachite for jewelry and ground it to use as eye shadow. It is used in amulets to protect against the evil eye. In the Middle Ages it was used to protect children from witches and other dangers. "Malachite has been called the "mirror of the soul". It is variable in its condition. It reaches the inner feelings of the person and reflects what is there, negative or positive. The last collectible this month is a pair of vintage silver salt and pepper shakers. 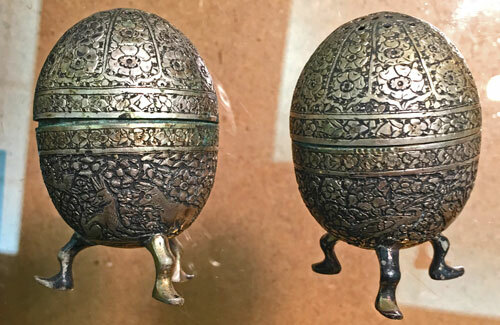 If cleaned, these would be bright and shiny, but the black tarnish helps display the intricate carving within the silver. Intricate flower designs adorn the top of each shaker while birds and dogs cavort among the plants on the bottom of each vessel. Is the design meant to be dogs hunting birds or did the artist just plan to illustrate a natural scene? Similar but not exactly the same, a seller described their online version of the three-legged antique silver salt and pepper shaker as American coin silver, circa 1890. Now, their version seemed to be more refined, so does that mean this set is older. Or, perhaps this version is later and intended to be not quite as graceful. Generally, the two shakers are not the same size. The larger of the two is the pepper shaker. And, did you know that for salt and pepper shakers that have different sized holes, the pepper goes in the shaker with the larger holes. Unless you live in the U. K. There, pepper at one time was a rarity, and they put pepper in the shaker with the smaller holes. Mark your calendars to join us for the second monthly coin show of 2018 on Sunday, February 11, 2018. 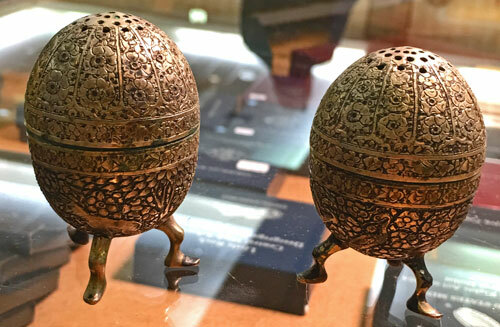 The showcases will display a variety of coins, currency, bullion and other collectibles where people can view, buy, sell or trade with the dealers.